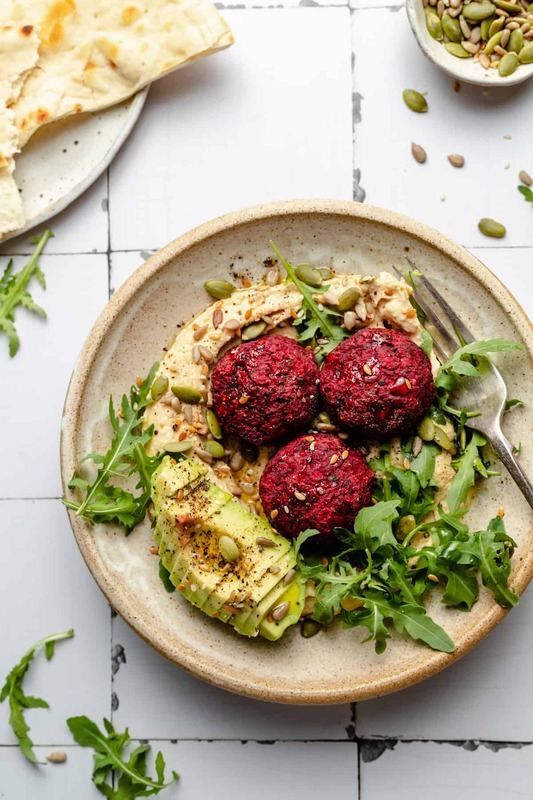 These simple to make beetroot falafel buddha bowls are an ideal packed lunch or light dinner! They’re totally vegan and baked, not fried! Behold, my new favourite lunch. 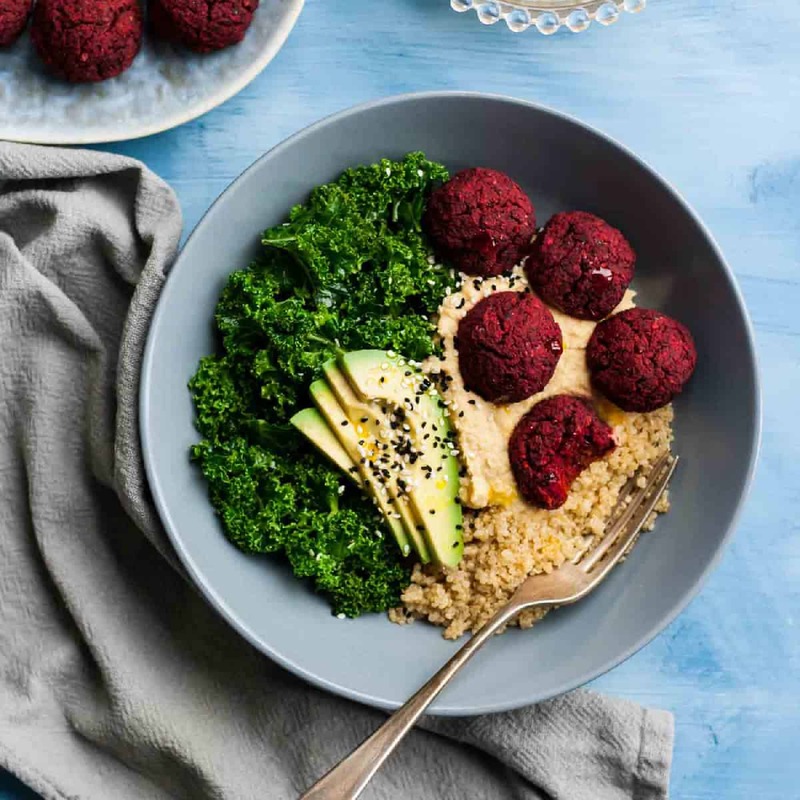 Beetroot falafel buddha bowls! If you’ve been reading for a while you’ll know that it doesn’t take long for me to get bored of well, anything, really. I’m talking strictly food-wise here – I’ll happily listen to the same five bands on repeat FOREVER. I know, I can’t believe how cool I am either. So here’s the latest creation to grace my lunchbox. Who knows how long it’ll last, but currently it’s in favour. Probably because I have a stash in the freezer so that on those rare (cough) occasions that I forget to pack a lunch for work, I’m saved. I’m all for an easy life. I have to admit, one of the main reasons I created this beetroot falafel recipe was for that incredible colour. We eat with our eyes first, right? I love beetroot but I don’t eat it anywhere near as much as I would like to. To be honest, in it’s raw form, it’s an absolute pain in the neck to deal with and the jarred pickled stuff doesn’t do it for me anymore (and it’s probably nowhere near as good for me anyway!). But! I chose to don my rubber gloves (told you I was cool), peel a few beets and then let my food processor do the rest. Best decision ever. These aren’t exactly authentic falafels, but when have you ever known my recipes to be authentic? I have the most fun in the kitchen when I play loose with the rules because that’s what it’s all about right?! FUN! And then eating the results, of course. Speaking of fun, yesterday I spent my afternoon making 120 of these delicious mini vegan chocolate cupcakes for a friend’s birthday party. Now that’s my idea of fun. The entertainment for the party came in the form of a barn dance which, if you’re not aware, is pretty much the most ridiculous form of dancing you can imagine. Now that’s NOT exactly my idea of fun! Picture a group of adults skipping and spinning and jumping around and you’re maybe halfway to imagining just how much of a fool I looked last night when I finally got the guts (read: got dragged) to get on the dance floor. So fun! I definitely need to remember to act like a little kid more often 🙂 I think we all do! You can build these buddha bowls up with whatever you like. 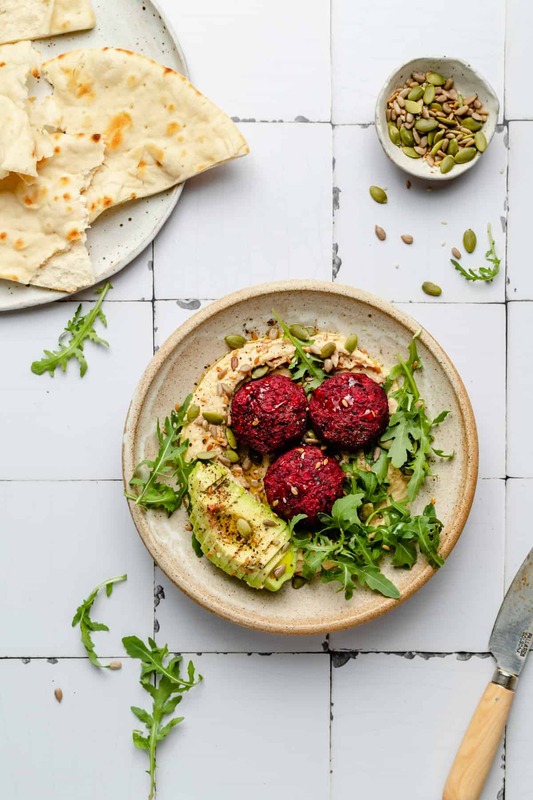 I love to let the flavour of the beetroot falafels shine by pairing them with the pure simplicity of some fluffed up quinoa, kale massaged with salt, rapeseed oil and lime juice, hummus and a few slices of buttery avocado. The beetroot falafels really do speak for themselves – they’re slightly sweet from the beetroot and packed with flavour from the spices. It’s all about that smoked paprika! I start to twitch if I don’t have any smoked paprika in the house – we get through it like you wouldn’t believe! 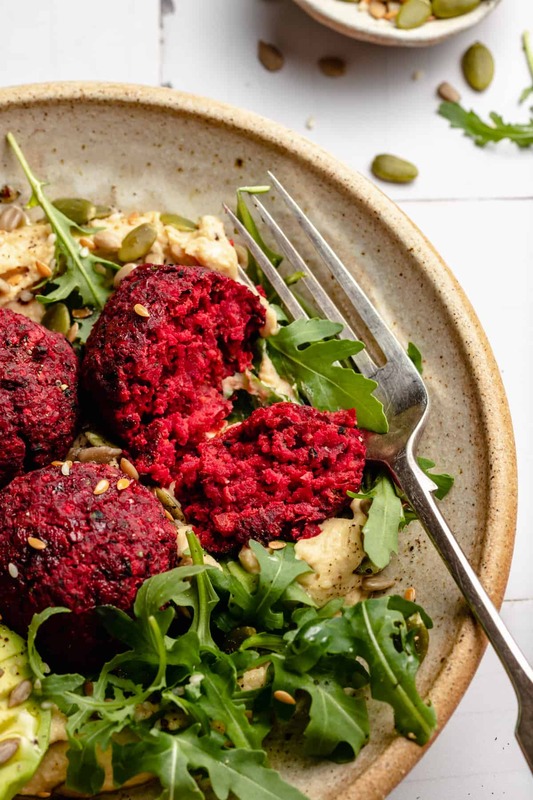 If you haven’t tried it, make sure you make these beetroot falafels right away and you’ll fall in love! And no skipping the nigella seeds either – they add so much flavour. The perfect antidote for when you’ve eaten a few too many cupcakes! Heat the oven to 180°C (350°F). Roughly chop the beetroot, sweet potato and red onion and place in a food processor with the garlic and parsley. Whiz until all ingredients are finely chopped. Tip into a large mixing bowl. Place the chickpeas into the food processor and whiz until very finely chopped. Add to the bowl with the vegetables. Add the ground spices, salt and gram flour to the bowl and mix until well-combined. Add more gram flour if the mixture is still wet and sticky - you should be able to roll balls of the mixture without getting too messy! Roll the mixture into golf ball sized pieces - you should get approximately 35 in total. Place the falafels onto a baking sheet lined with baking parchment or a non-stick liner. Bake for 30 minutes. When they're done, they should look slightly cracked on top. Leave to cool before serving. Use to top your favourite buddha bowl - I love to serve mine with quinoa, massaged kale, hummus and avocado! Nutrition information is for one falafel. I'd reckon on about three falafels for a decent lunch. 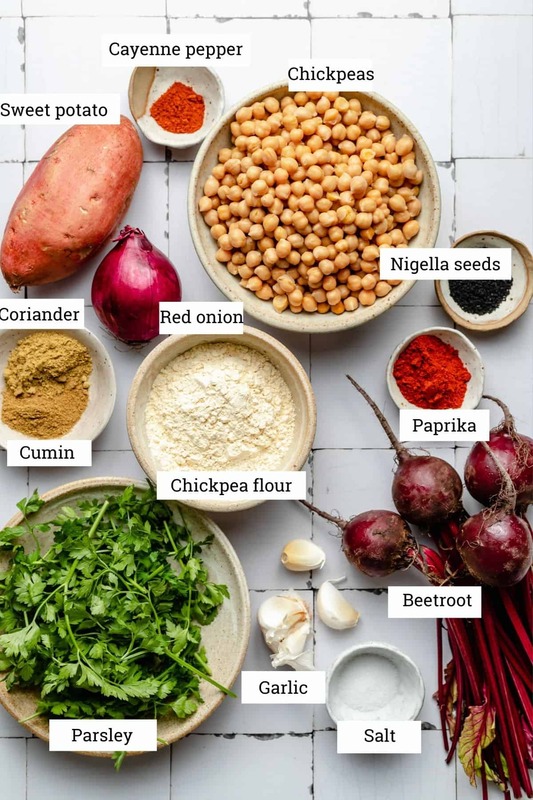 Depending on your experience and the strength of your food processor, the prep time for these falafels could take longer than stated. These pictures are perfection and this dish is right up my alley! I so wish I had a bowl ready. Yummy. I’m cool like you and wear rubber gloves when I peel beets and grease pans, etc. 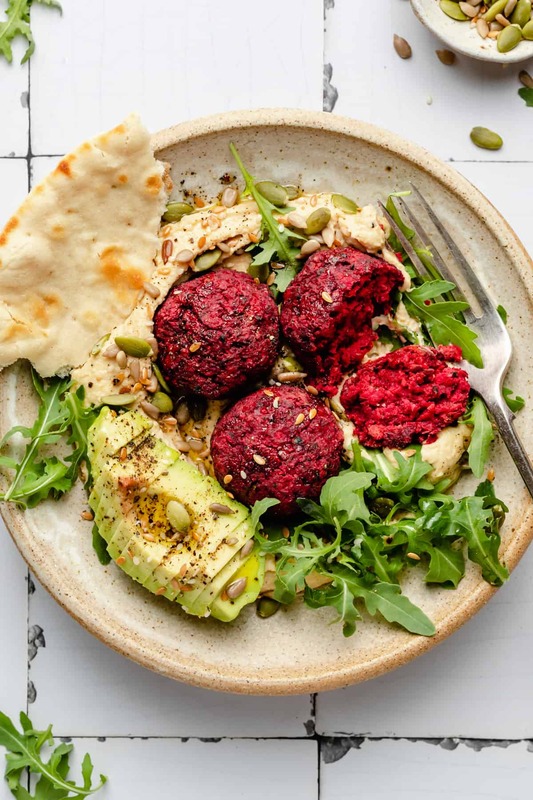 These beetroot falafel looks so delicious. I want some for lunch! Oh thank you Amanda! I really hope you love the buddha bowls! Yummy! That would be definitely be something you find in my lunchbox! You’re right, we eat with our eyes first, and those colors are just beautiful! We buy beets often and it’s always good to have another recipe to try. Love it, Sasha! Just two questions, do you use raw beetroots? And could I sub the chickpea flour for oat flour? Looks great! Will definitely re-pin, and make soon. Can you just double check the nutrition info? It says zero calories – so something didn’t quite add up. Thank you! Great! I hope you love them! Oh sorry, that’s weird. I checked it and it’s showing up now – it must have glitched or something. Just so you know, there are 43 calories per falafel! Oh you won’t regret it! Let me know how you get on with them 🙂 haha I love making cakes! Hi – do you freeze these raw or cooked? These were amazing. Soooooooo simple…from the fact the food processor takes most of the strain, to the ability to pop a few out of the freezer, whack them in a lunchbox and they were defrosted and ready to eat by midday. So delicious too…I love the kick from the cayenne and the warmth of the other spices. More lunchbox recipes like this! I’m a total convert. Great recipe. Simple enough. My food processor wasn’t powerful enough so I think i’ll have to grate everything before I chuck it in. Also, if you’re a cook newbie like me, this took a HOUR AND A HALF to make, not 45 minues! Hi Emma, glad you enjoyed the falafel! Sorry about the time – it can be hard to gauge as people’s experience with cooking varies so widely! I’ll adjust accordingly.